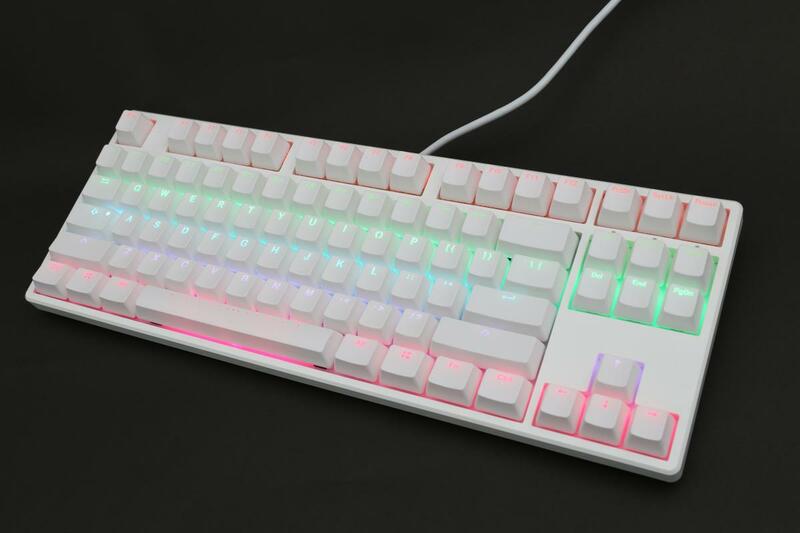 Its honestly really annoying that ducky does not make this keyboard or any white RGB keyboards. they make so many others that honestly don't even compare to the look of the ducky one 2, shine 6 7, or even the one 2 mini. 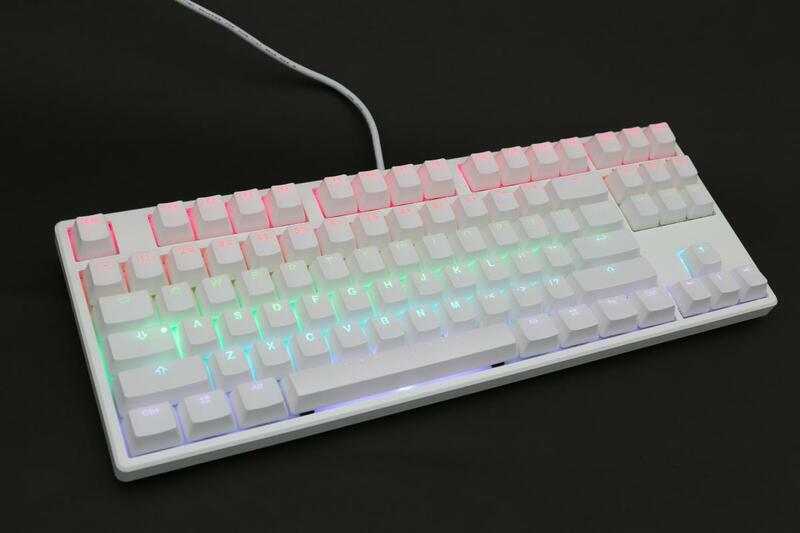 However, the any ducky white rgb keyboard hasn't been in stock for a long time. I have even contacted ducky and they said they were coming very soon this was about 3 months ago, so clearly that was a lie. I'm honestly just considering competitors at this point. I ordered this keyboard a little less than a year ago but the spacebar seems to cling to the keyboard from time to time (I tend to hit the right side of the spacebar). It also looks slightly uneven. Even though it is a very pretty keyboard and the rest of the keys function properly this is becoming a major issue to me whilst gaming. I thought I had purchased a keyboard that would last me at least a couple of years. Have this keyboard (with red cherrymx) since about a month. Very satisfied with it overall ; the range of backlighting modes available is very nice, The keys themselves feel very stable and are fairly easily to pull out when I have to clean the keyboard. The coloured keycaps for the esc, arrows and other keys are a nice addition as well. Would definitely recommend this keyboard. Impressed with the quality of this board, coming from a K65 RGB and a K70 RGB. The keycaps feel solid, with a slightly rough texture to them. My keyboard came with a keycap puller, a Year of the Dog AND normal spacebar, and some purple non-backlit keycaps for arrow keys, backspace, ESC, and return (for 100% keyboards I assume). The lighting is vibrant during daytime, and during nighttime it's gorgeous. 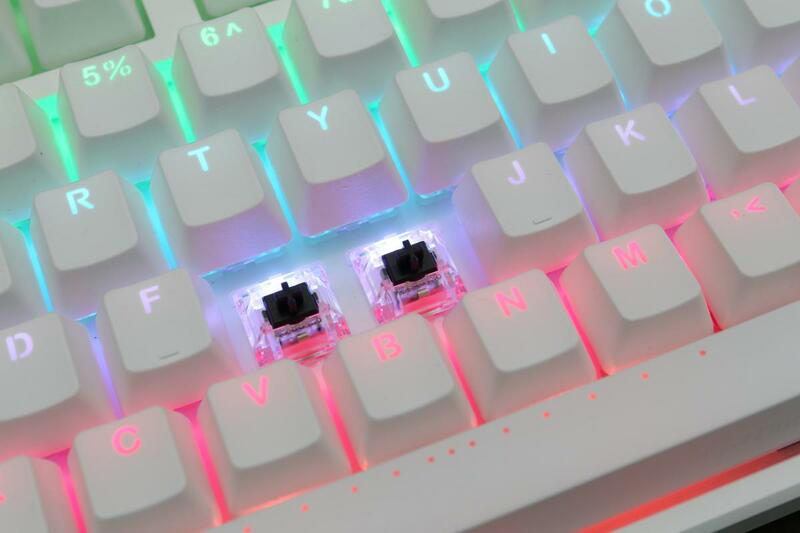 The keycaps do not have backlight bleed as far as I can tell, but the bright backplate combined with the powerful lights creates light reflections along the sides of the keycaps that look similar to backlight bleed. The chassis is very rigid, and the keyboard is a bit heavy. The bottom of the keyboard has a plug for the cable, and additional pieces so you can route the cable under the keyboard to the left, right, or center. Overall, I'm very happy with this keyboard. Amazing keyboard, love how it's a TAKE and how the keys feel. The nature whites are something you need to get used to. They are harder to press than mx blue keys and little easier than mx black keys. The keyboard is still quite, so if you are looking for something that doesn't disturb people this could be a good choice. 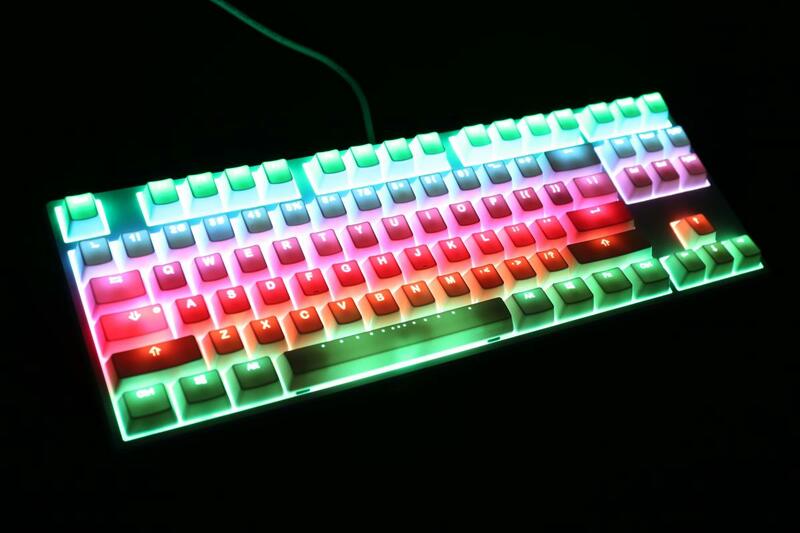 The only thing I was sad about was this keyboard doesn't have a RGB software, so you have to use keys to change the settings but that's not really a big deal. All in all I would buy another ducky tkl cuz shits lit fam. 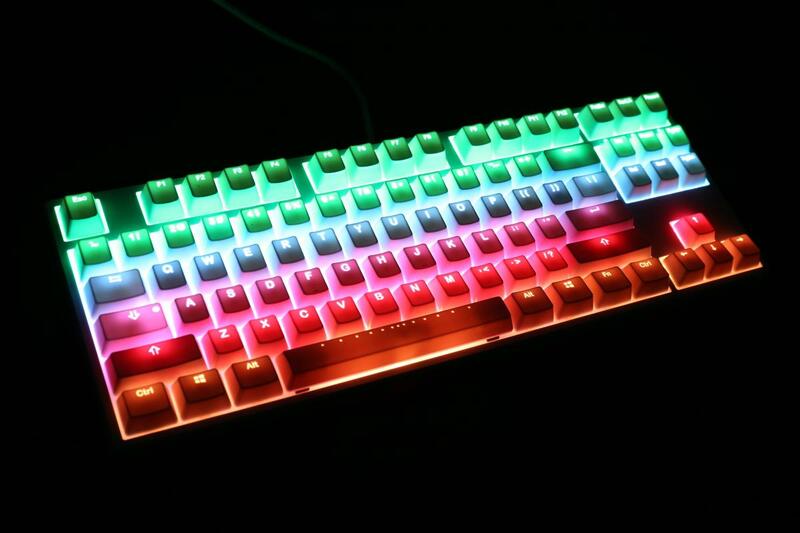 Very cool keyboard. Ducky keyboards scream quality. LED's are bright enough for me. The blue could be a little brighter, but that is nit picking as blue led is generally a dimmer color. I am really happy with my keyboard. This is my second Ducky keyboard as I like my old shine 3 and went with Ducky again. Perfect keyboard for me as far as TKL's are concerned. I've wanted a white RGB Ducky for a while, but didn't want a full board. 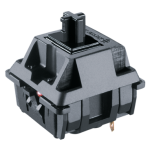 - The switches are what you'd expect from Browns. Slight tactile bump, smooth all the way through, and easy to type on. - Stabilizer keys are perfectly done (no mushiness or difficulty pressing). - Lighting is absolutely gorgeous on this board. - Keycaps aren't PBT, we know that, but they are nice enough doubleshot ABS. They have a nice coarse texture on them, and I very much enjoy typing on them. As far as TKLs are concerned, I now have my perfect board. If only Ducky would make a 60% with a standard port layout so I could use aftermarket cases and properly done stabilizers, I would get that and live happily ever after.